A pionono is just like a jelly roll cake - it's a sponge cake that has been rolled up around a filling. Piononos can have sweet or savory fillings. This pionono is filled with dulce de leche that has been lightened with whipped cream. All this cake really needs for adornment is a dusting of confectioners sugar, but it's delicious drizzled with a glaze of caramel icing. This type of cake is also known as brazo de reina in some Latin American countries. Line an 11" x 17" jelly roll pan with wax paper. Preheat oven to 350 degrees. Sift the flour with the salt, almond meal, and baking powder, and set aside. Place the egg whites in a (very clean) bowl of a standing mixer and beat until soft peaks form. Add 1/4 cup of the sugar and continue to beat until stiff peaks form. Transfer beaten egg whites to a clean bowl. Add the egg yolks with the remaining 1/2 cup sugar to the mixing bowl, and beat until pale yellow and tripled in volume, about 5 minutes. Add the vanilla and mix well. Fold the dry ingredients gently into the egg yolk mixture until just blended, then carefully fold in the egg whites. 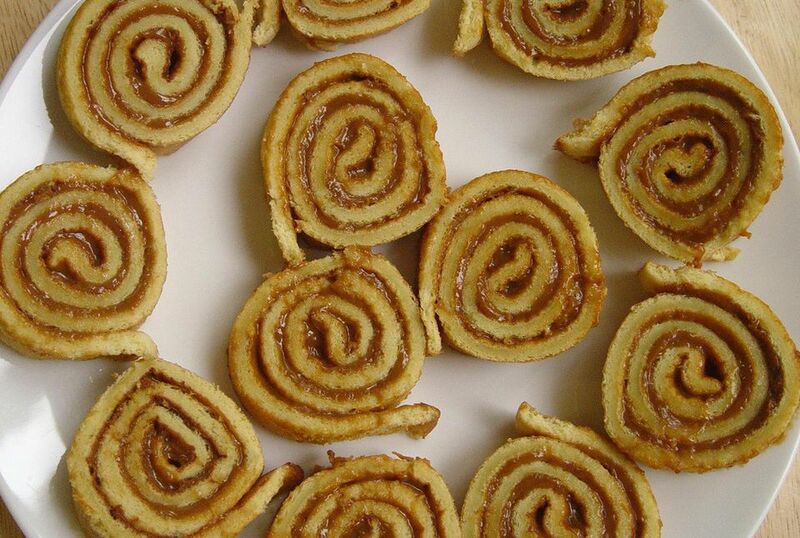 Spread batter evenly into the prepared jelly roll pan. Bake cake until it is golden and just starts to spring back to your touch, about 8-10 minutes. Do not overbake, or it will be difficult to roll. Loosen the edges of the cake by running a knife around them, then turn cake out onto a dish cloth that has been dusted with confectioners sugar. Peel off the wax paper, and dust top of the cake with more confectioners sugar. Roll cake up carefully in the dish towel and let it cool in the rolled-up position. Place cold whipping cream in a large bowl and beat until medium-firm peaks form. Whisk in 2 tablespoons sugar and a touch of vanilla if desired. Whisk 1/4 cup of the whipped cream into the dulce de leche to lighten it, then fold dulce de leche mixture back into the rest of the whipped cream. Unroll cake and spread whipped cream/dulce de leche mixture over the cake. Reroll cake, wrap with the dish cloth or saran wrap, and chill for 1-2 hours or overnight. Chill cake until ready to serve.